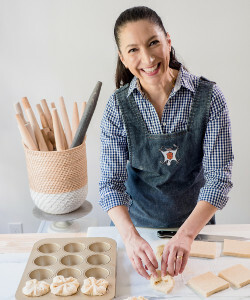 Scheduled during our Annual Book Angels Fundraiser Cake Auction, the host of Food Network’s Baked in Vermont will present her key to making the best cakes. Learn to make doable, incredible celebration cakes that taste as good as they look! To learn more about our Annual Cake Auction click here! Gesine Bullock-Prado is the owner/instructor of Sugar Glider Kitchen, a baking school in Hartford, Vermont. She lives in a small farm with her husband, two dogs, two cats, chickens, and water fowl. She bakes and cooks from the bounty of her property. She is the author of Bake It Like You Mean It, Let Them Eat Cake, My Life from Scratch, Sugar Baby, and Pie it Forward and has been featured in Better Homes and Gardens, People Magazine, Us Magazine, Yankee Magazine, and In Style Magazine. She appears regularly on the Today Show and The Talk, and she's the host of Food Network's Baked in Vermont. She lives in Hartford, Vermont.